Netflix has been criticised for removing an episode of a satirical comedy series in Saudi Arabia because it was deemed critical of the kingdom’s rulers. Episode two of US comedian’s Hasan Minhaj’s Patriot Act was pulled after it criticised Crown Prince Mohammed Bin Salman over the alleged murder of journalist Jamal Khashoggi. 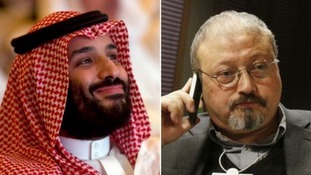 Mr Khashoggi, a vocal critic of the kingdom’s royal family, was killed at the the Saudi consulate in Istanbul in October. Netflix confirmed to the Financial Times it had pulled the episode after receiving a complaint from the kingdom’s Communications and Information Technology Commission that it violated Saudi anti-cybercrime law. The streaming giant said: "We strongly support artistic freedom and removed this episode only in Saudi Arabia after we had received a valid legal request - and to comply with local law." The episode in question is reportedly still available in Saudi Arabia on YouTube. In it, Minhaj criticises Saudi Arabia for Mr Khashoggi’s death and the country’s involvement in the ongoing war in Yemen. Saudi Arabia has charged 11 people with the death of Mr Khashoggi, though strongly denies that the crown prince ordered the killing. In December, the US Senate passed a resolution saying the crown prince is responsible for the death. Karen Attiah, Mr Khashoggi’s editor at The Washington Post, said Netflix’s decision was "quite outrageous". She said on Twitter: "Hasan Minhaj of Patriot Act has been a strong, honest and (funny) voice challenging Saudi Arabia and Mohammed bin Salman in the wake of Khashoggi’s murder. "He brought awareness about Yemen. "Quite outrageous that Netflix has pulled one of his episodes critical of Saudi Arabia."